We do not have a comprehensive list of the birds we see in Tanzania but in Botswana we have a very long list of possible bird sightings given to us by the safari company. Even though we check-mark sightings off the list, we do have trouble identifying them in the field. There are just so many different birds here in Africa. 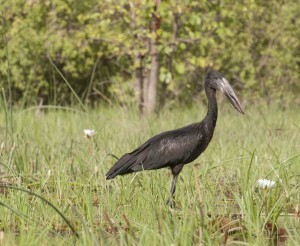 There are Water Birds – storks, ibis and hamerkop. 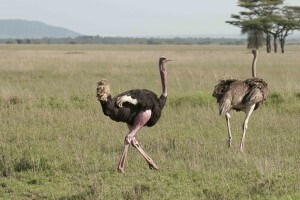 There are Ground Birds – ostrich and cranes. There are Raptors – the infamous chicken stealing kite, secretary birds and vultures. 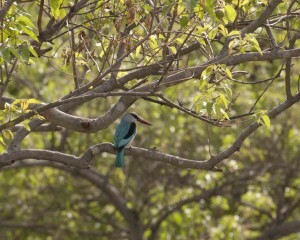 There is a group called Near-Passerines – hornbills, kingfishers and rollers. And these are just a few of the birds that we see. We see many Crested Guinea Fowl and from a distance they are eye catching but up close their beautiful colored heads are completely prehistoric. Egyptian Geese roughly resemble our geese but are much prettier and smaller. A Spectacular Starling is indeed spectacular with its blue back and brilliant gold breast. 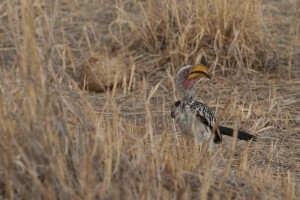 Secretary Birds look like stenos with a drooping black crest that looks like a Victorian clerk’s quills. This entry was posted in Tanzania and Botswana and tagged birds, Botswana, Tanzania. Bookmark the permalink. I looked at all pictures from Tanzania and Botswana,they are great pictures.Keep the spirit burning Debbie and Murray. Thank you Pat! We ended up with some great photos of birds. Your attempt to turn us into birders was working! Great time in Botswana!